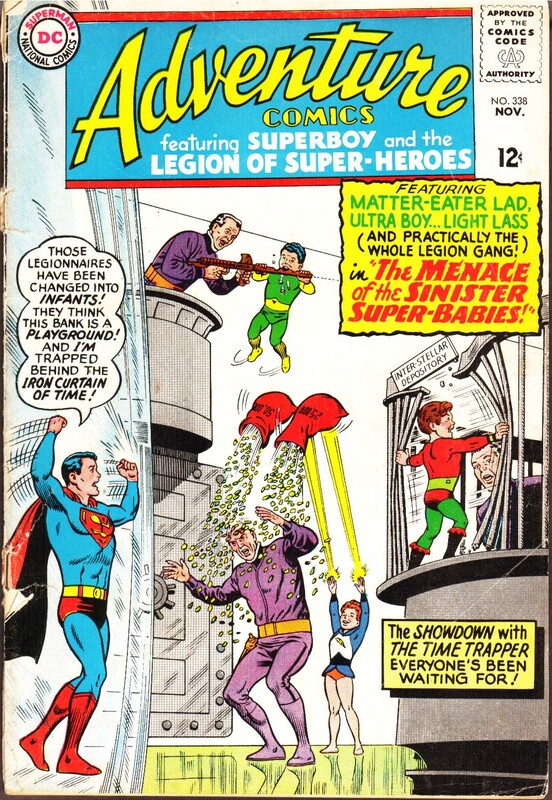 As 1965 moved towards 1966 the next Legion of Super-heroes adventure came out in issue 338 of Adventure Comics. The building of the Legion universe was well underway and this comic was no different. Much like many of the silver age comics this issue had tonal issues shifting between being goofy and being serious all at once. However, lets turn to the plot and explore what happens to the Legion in this story. The story itself starts in the far future where the Time Trapper holds court. He summons a henchwoman by the name of Glorith of Baaldur and gives onto her a magical hourglass which has the ability to turn someone young until they turn into protoplasmic slime. Her mission than is to turn the hourglass on the Legion. 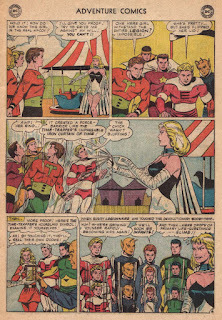 In our future but the Legion present various members are up to fun and games with Invisible Boy trying to escape from a date, Matter-Eater Lad spending time with his parents and Chameleon Boy filming a move but each summoned by Saturn-Girl. Glorith has betrayed the time-trapper and wishes to meet them at a amusement park where she shows of various powers to convince them and soon gets the Legion members to touch the hourglass which soon turns them all into children. However, this was not what was meant to happen as they were all to turn to blobs. Seeing this the time-trapper moves to take superboy of the picture and join Glorith in the past. Elsewhere Superboy and Brainiac 5 per the trappers trap are stuck a million years in the future. Back in the present the time-trapper sees that every Legion member still has control of their powers and uses them to conduct criminal activities ranging from Robbing a bank to stealing a train and various other crimes. Once these crimes are completed the time-trapper turns on Glorith and forces her to turn into slime for her failure. The trapper than takes them off planet to finish turning them into blobs. His plan back fires on him when Element Lad turns his ship into candy and the child Legionnaires start to eat. This allows Superboy and Brianiac 5 to arrive. The time-trapper than cuts a deal wit them to save their lives and they soon become teenagers again. 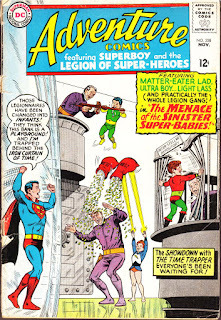 In a twist the trapper is trapped thanks to Brainiac 5 using a Force-Barrier ring which had by found by a child Starboy. The comics ends with the group laughing. What does this story contribute to the history of the Legion of Super-Heroes? Overall it does not create much new. However, it continues to show the danger the time-trapper is and how he is one of the most dangerous villains to date. Perhaps the greatest legacy this issue contributed is the character of Glorith who while appearing as a one shot character would appear decades later. Outside of these contributes to the history it also presents how teenagers of the future did things. Culture is important as their is a museum of Romance and that family is still very important. Movies and amusement parks also still exist and the importance's of law and order is to the protection of goods and services. Lastly, tech is reflective of the time of writing with the movie cameras right of the 1960's. However, it also marks that the spaceships were also starting to mirror technology of the time and less of the serials and stories of pulp science fiction. Ultimately, to close this issue it is pretty standard for its time but changes in story telling are slowly starting and making the future look promising.